H istorically, Men-Tsee-Khang or Tibetan Medical and Astrology Institute (TMAI) was first established in 1916 by the 13th Dalai Lama in Lhasa, Tibet. After the Chinese occupation of Tibet, His Holiness the 14th Dalai Lama, followed by some 80,000 Tibetans, took shelter in India. In order to preserve the rich Tibetan religious and cultural heritage, His Holiness re-established traditional Tibetan institutes of scholarship and learning in exile. Thus, in March 1961, His Holiness the Dalai Lama re-established Men-Tsee-Khang (TMAI) at Dharamsala. The primary objective is to preserve, promote and protect the traditional Tibetan system of medicine (Sowa-Rigpa) and astrology, which has been practiced down the ages for centuries. The institute initially started with a doctor, an astrologer and ten students, enrolled in two schools: Chopra House and Gleenmore Cottage. In 1967, the two schools were merged into what we now know as Men-Tsee-Khang or Tibetan Medical & Astro. Institute. At that time, it was located in Mcleod Ganj. The institute was later shifted to the present location in 1982. The TMAI aims to preserve, promote and practise Sowa Rigpa, the traditional Tibetan system of medicine, astronomy and astrology. The mission statement of TMAI also includes education and higher studies in the fields of Tibetan medicine and astrology, research and collaboration with scholars and institutes in India and abroad between different healing systems, and to produce Tibetan medicines in an environmentally sensitive manner. 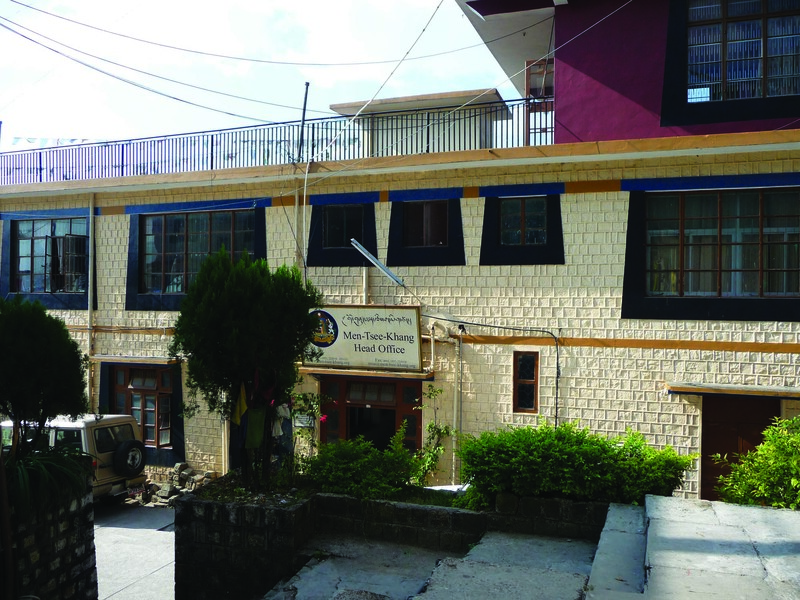 The TMAI headquarters at Dharamsala consist of numerous academic and administrative departments. The institute is run by a governing body of ten members, which includes Health Kalon as a chairman (served by the officiating officer from the Central Tibetan Administration) and a secretary (served by the director of the TMAI). The institute today employs 521 staff members which includes Administrative, Medical, Astrologer and temporary workers. The institute at present runs a wide network of 54 branch medical clinics across India. Out of which, 36 are based in Tibetan settlements and 18 in cities and rural areas. Delek Hospital has been providing health care services in Dharamsala for more than four decades. Th e visionary behind Delek Hospital was Mr. Tsewang Rinchen Rishing (Former Bon Chithue/MP) who proposed the founding of an allopathic dispensary to cope with the many health problems in Tibetan refugee community. With His Holiness the XIV Dalai Lama’s blessings, Tibetan Welfare Delek Hospital was officially inaugurated on October 4th, 1971. A new extension block of the hospital was constructed in 2010 by the Italian Government through their NGO, AISPO. Although distinctly autonomous in its administration and funding at present, the hospital falls under the auspices of the Department of Health of the Central Tibetan Administration. The hospital has a nine member governing Board of Directors with Health Kalon as a Chairman and the day-to-day administrative work is overseen by an Administrator (CEO) who is supported by the Chief Medical Officer and the Hospital Secretary. Hospital has 49 staff members of both medical and non medical. Delek Hospital has an In-patient capacity of 45 beds of which the majority are occupied by TB patients. Round-the-clock care is provided by a total of 10 nurses including two Matrons. Other facilities include an operating theater (for minor surgery), recovery room, emergency room, delivery room, E.C.G., Heart Monitoring and a wide range of laboratory services. Additionally, Delek Hospital has a full fledged Out-patients (OPD) unit, Laboratory, Pharmacy unit, dental clinic, eye clinic, TB control clinic and a public health unit. It also runs an outpatient branch clinic at Mcleod Ganj. Delek Hospital has played a very important role in the prevention and treatment of TB in the Tibetan community. Besides TB, it provides treatment of all major infectious and non infectious diseases to both Tibetans and otherpeople in the locality. It also provides maternity services and conducts normal deliveries. Under the National Immunization Programme, all children are provided with the following vaccines: BCG, Polio (OPV), DPT, Hepatitis B, Measles, MMR and Hib. Community Health Workers (CHW) Training has been conducted at the Delek hospital since 1981. To date, Delek has trained 265 CHWs and given 17 Refresher courses to 204 Health workers. Hospital also serves as elective centre for medical students from around the world and for Men-Tsee-Khang interns. Additionally, it creates public health awareness to the general public on important health days like World TB day, World Health day, HIV AIDS etc.